One of the best parts of owning a dog is watching them swim during the summer months. Many dogs love to swim, and their joy is palpable when they leap into the water chasing after a tennis ball or stick, then enthusiastically return it to their owners. However, there are many safety tips for swimming with your dog that need to be considered as the summer approaches. Just like humans, swimming ability differs in each dog, as does their ability to learn how to enjoy the water safely. Some dogs such as Poodles and Newfoundlands are built for swimming, and other dogs such as Boxers, Bulldogs, and Basset Hounds are not great swimmers. Whether your dog is a proficient or struggling swimmer, many factors can come into play in the water that responsible dog owners need to consider. Confident swimmers can quickly run out of steam and need assistance returning to dry land. 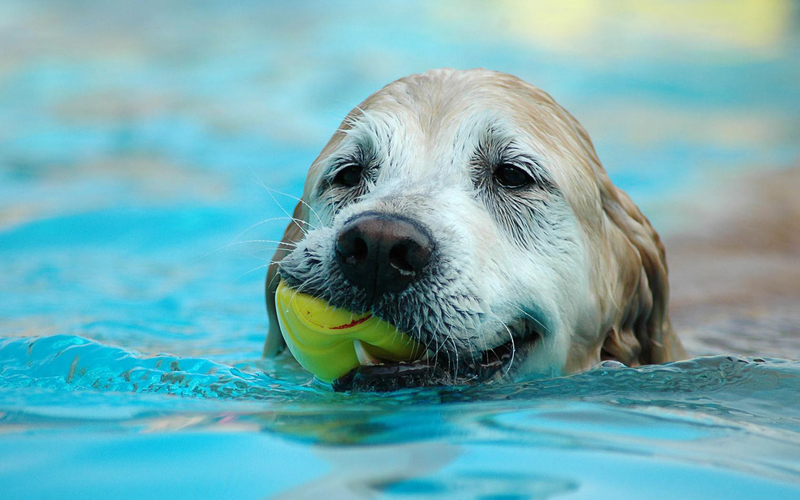 Many dogs develop mobility issues such as arthritis that cause pain and fatigue while swimming. Also, hidden dangers like current/undertow can turn summer fun into serious tragedy in a matter of moments. Swimming is a great exercise to enjoy with your dog, but safety needs to be the top priority before you head out for a dip together! Before you take your dog swimming, play around the water first. Never assume your dog will love the water even if they are a water-loving breed. Throw the ball to your dog and let your dog splash in the shallow water, so they associate the water with fun. 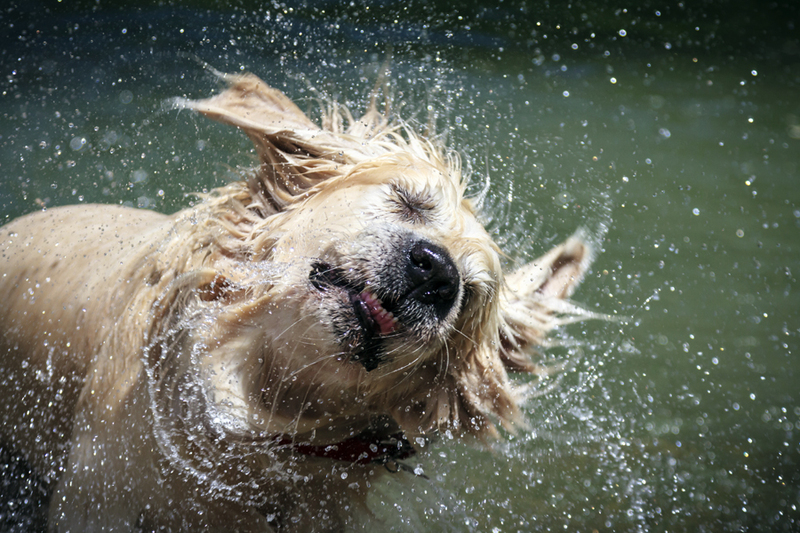 If your dog has some reservations about water, have several play sessions until he’s comfortable with the splashing. Let your pet walk around the perimeter of the water on land to get used to things, waiting for him to be relaxed and wagging his tail before helping him in the water. Never rush your dog as they adjust to the idea of water, as it could instill a fear of water for years to come. Never let your dog swim without you there. If your dog has access to a pool at home or while you are on holiday, make sure there is a safety cover or safety fence. At home, a permanent, secure fence is the best option, but make sure it’s something your dog can’t jump over or climb. A removable fence is also a good option if a secure fence is not feasible. Never throw your dog into a pool or body of water. The colder temperature could cause a shock to your pet’s system. 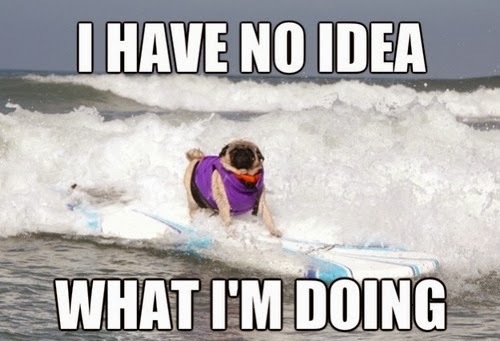 Your dog can also develop a fear of swimming when suddenly thrust into water. Lifejackets aren’t just for people; they are made for dogs too and are equally important. You can pick one of up in your pet store or order online. 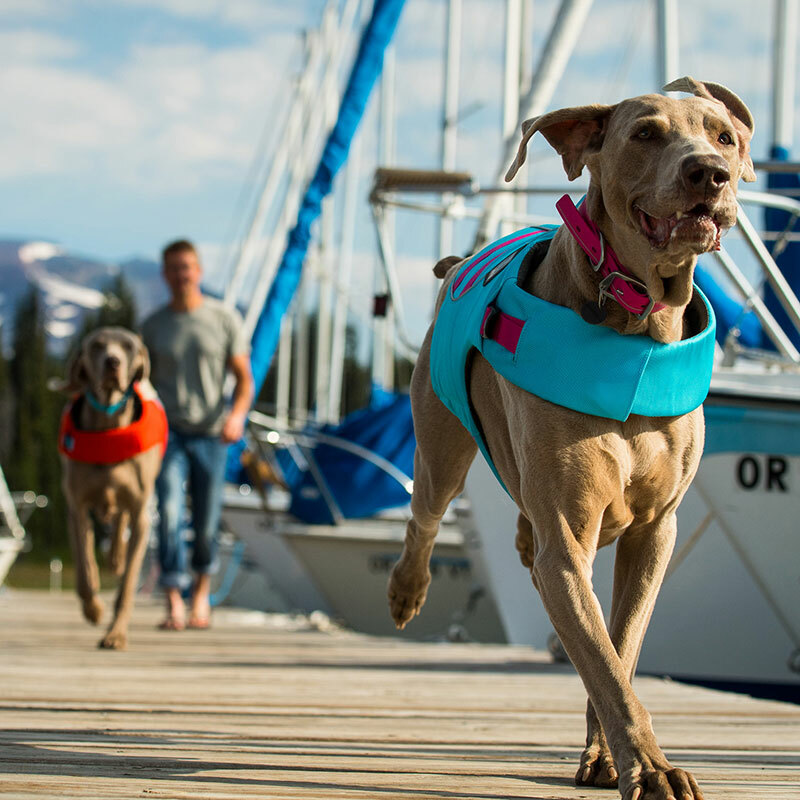 The Ruffwear Float Coat is a premium, fully-featured life jacket that includes thoughtful details like a strong handle, optimally positioned to lift dogs out of the water, and reflective trim for enhanced visibility in or out of the water. It also comes in a variety of colors to suit your dog’s unique personality. To help your dog get in and out of the pool or a boat safely, there are special ramps called skamper ramps. You can put one on the side of your pool for your dog to get in and out. Take your time to allow yourself to demonstrate how to use the ramps so that the dog can figure it out for themselves Once the lesson is done give verbal praise and treats to connect treats with swimming. Make sure the ramps are easy to install, have a non-slip surface, and smooth edges to prevent your dog from getting an injury when exiting the water. Here are 5 great ramps pool and boat ramps for you to consider as you begin to teach your dog to swim safely. Pet swimming pool alarms help provide an extra level of security to your pool & your pet. The Safety Turtle 2.0 Pool Alarm Pet Kit loops around your dog’s collar. If your dog falls into the pool and you’re not outside, an alarm goes off inside your house. You can add as many pet adapters to a system as needed. If your pet enters the water, the alarm will go off. This is better than a pool alarm because it’s always working and there are no size or weight limitations like many other pool alarms. 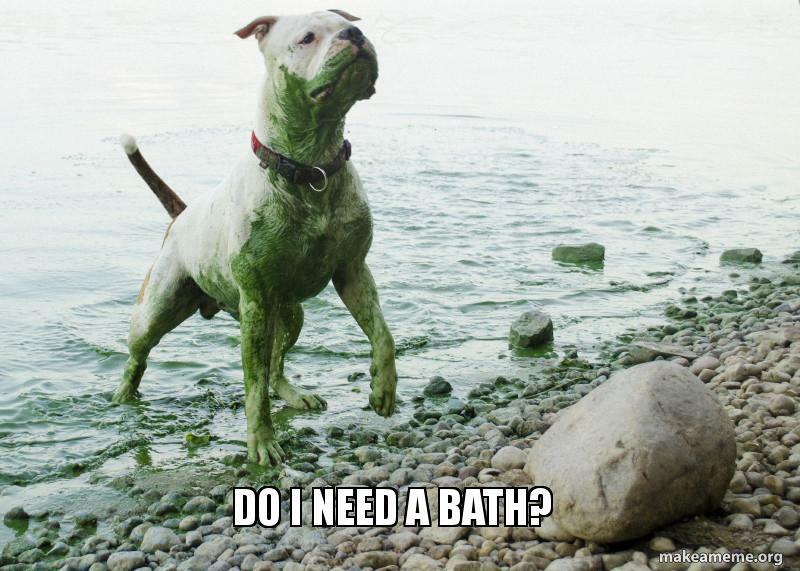 Watch out for blue-green algae when your dog takes a refreshing dip! Hot weather also means a bloom of blue-green algae on many lakes and ponds. This alga is toxic for dogs and can be fatal. Blue-green algae are mostly present in late summer/early fall, but they can occur any time conditions are ripe. Even a small amount ingested can kill your dog within an hour. You also need to be careful of algae in swimming pools. If he drinks from the pool, they are absorbing all that chlorine, algaecides and baking soda that was added to turn your pool from swamp green to sparkling blue. This has the potential to make your dog very ill.
Keep your dog away from any dangerous currents in fast-flowing streams, lakes, and oceans. This article talks about identifying different currents to keep, your dog, yourself and your family safe. Your dog will want to drink lake or river water, but he’s safer drinking water that you bring from home. You’ll reduce not only his risk of running into potentially bad bacteria and parasites like giardia but also lessen the chance of minor tummy troubles. If your dog does digest water, getting ready for some GI upset and plan a few extra walks to avoid any accidents in your home or car. Water in your dog’s ears can lead to ear infections and discomfort. Start by towel-drying your dog’s ears after swimming with a clean towel or washcloth. This will help prevent discomfort and imbalance caused by excess water in the ear. It will also avoid swimmer’s ear and other infections. Drying your dog’s ear is a quick and easy process, and they will love the extra attention. If your dog is prone to ear infections, bring along some ear cleaning solution on your swimming trips. After swimming with your dog, brush them immediately and do a good head to tail check looking for ticks, cuts, and thorns. A small cut from a branch at the local lake could quickly become infected if not treated right away. Tick bites can also lead to a problem if left undetected. Sea lice can also present themselves after swimming in an ocean. Sea lice are microscopic organisms that can cause severe itching. After swimming in the ocean you and your dog should rinse thoroughly with fresh water immediately. If you see red bumps, and your dog is scratching furiously, take him to a veterinarian for treatment. 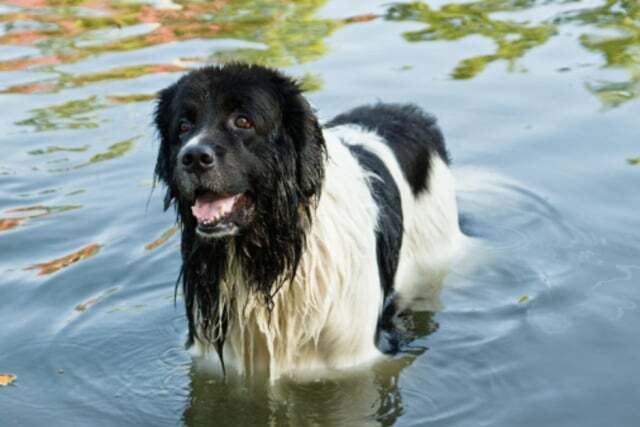 With these tips in mind, your dog will have an incredible summer swimming in pools, rivers, oceans and lakes. Simply use common sense and have a terrific time bonding with your four-legged furry swimmer. If you found this article useful, please SHARE it with anyone who could use some safety tips when swimming with their dog!